In other parts of the world, this sweet is popularly eaten as a sweet snack. Sweet taste is offered to Jalebi, by dipping the fried stuff in sugar syrup. Often kewra essence, kewra water or rose water is incorporated into the batter for authentic flavor. Jalebi is believed to be derived from a similar dish of West Asia. 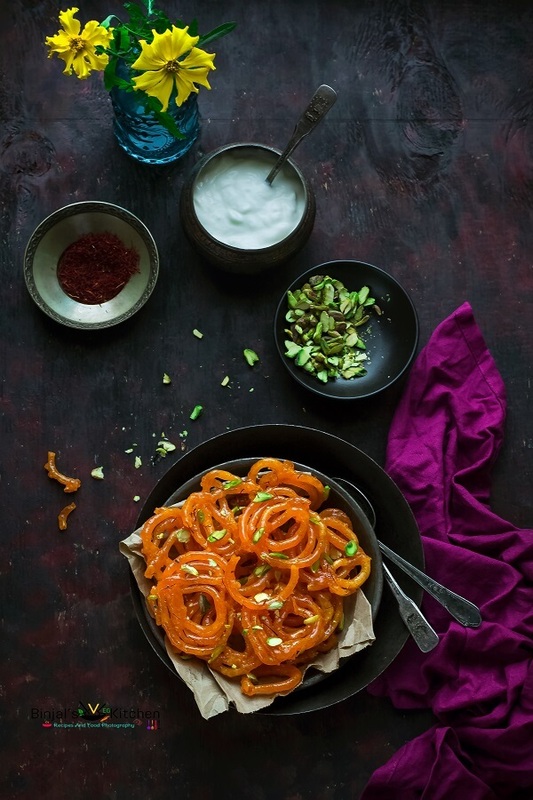 According to Hobson-Jobson, the word Jalebi is derived from the word Arabic Zulabiya or the Persian Zolbiya, the name for a similar dish. 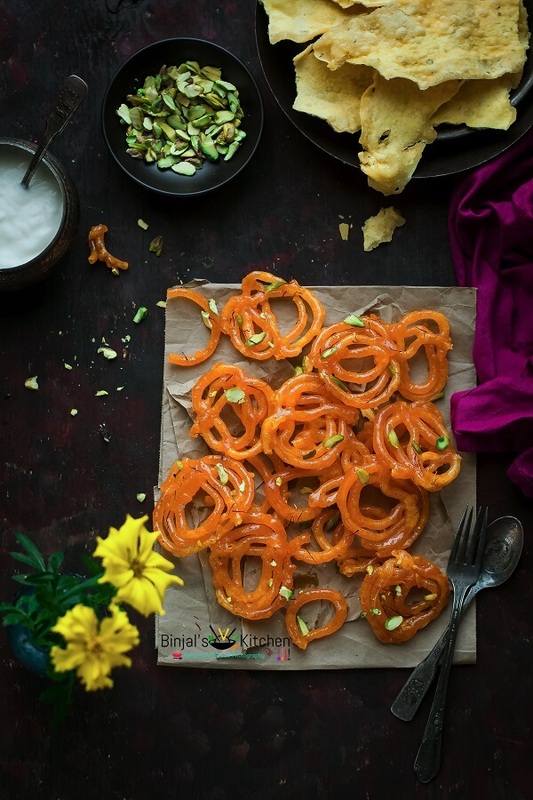 In 15th century India, Jalebi was known as Kundalika or Jalavallika. So, one can say with some measure of certainty that the Jalebi has existed in the Indian subcontinent for at least 500 years. In India, as in West Asia, it is known by various names: Jilbi, Jilipi, Jilapi, Zelapi, Jilapir Pak, Imrati, Jahangiri and so forth. The ingredients vary from region to region. Though it is an Arabic dish, it is largely popular in India, Pakistan and Bangladesh. 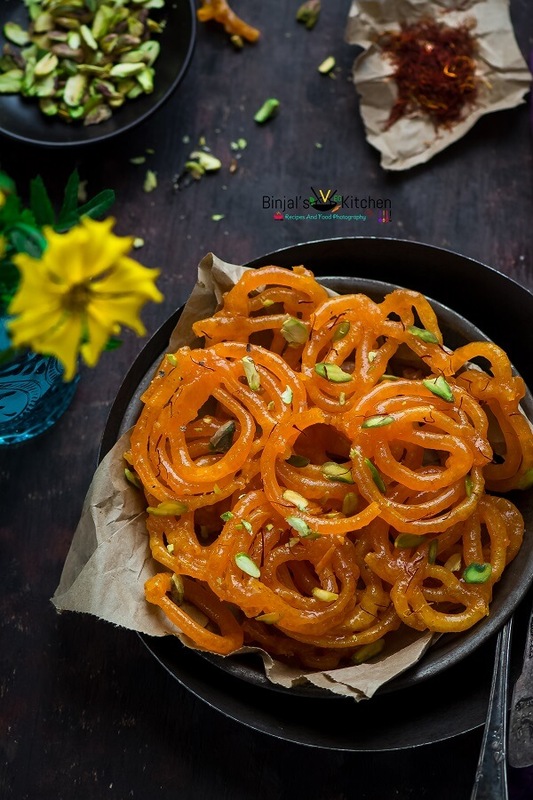 The main characteristic of Jalebi recipes is the use of sugar syrup known as ‘chaashni’. 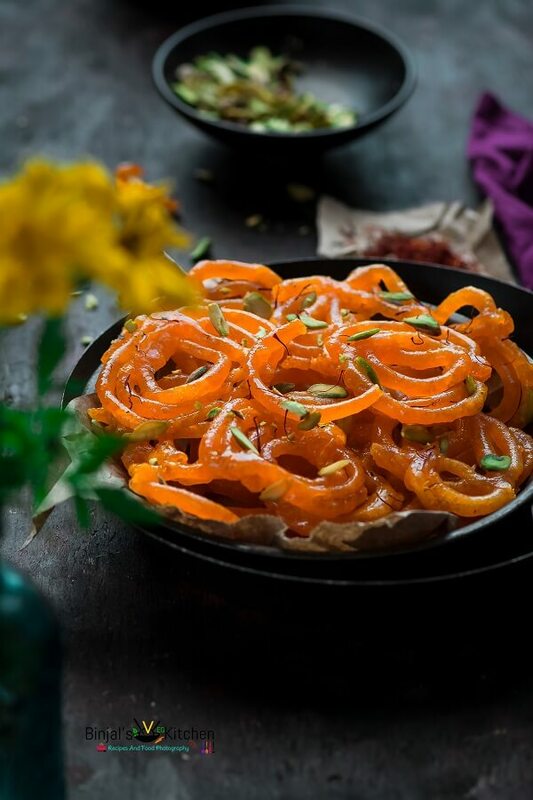 This syrup provides a crystallized sugary coating to the Jalebi. And sweet taste makes this dish quite popular among people of all age groups. 1. Sieve the flour, baking soda, cardamom powder and orange food color all together in a mixing bowl. 2. Add yogurt into the flour mixture and mix it till no lumps. 3. Add kewra water and mix it and make a thick, smooth paste like dropping consistency, but not too thin, add required water if necessary. 4. Cover the mixing bowl and leave to ferment for 7-8 hours (time is depending on the weather). 5. Once the batter is ready, it should be spongy and you can able to see bubbles on top of the batter surface, that means it’s perfectly ready. 5. In a deep pan, add sugar, water, saffron strings, cardamom pods and lemon juice, and cook it on high flame till thick syrup. 6. Check the syrup, take a drop of syrup (cooled) in between your thumb and finger and then pull the fingers apart, it should be one thread/string. Keep warm aside till you fry the Jalebis. 7. Heat oil or ghee in a broad pan on low to medium. 8. Mix the batter using a spoon, then take a squeeze bottle and fill it with the prepared batter. 9. Check oil is ready, drop in a little bit of batter in the oil, and see if it comes up at once. If it does, that means oil is ready for frying. 10. Now hold the bottle upside down and squeeze it and make a swirl into the hot oil, make more swirls straight into the hot oil and make as many as swirls you can, keep the space between Jalebis to avoid sticking. 11. Fry both sides of the Jalebis till light golden brown on low to medium flame. 12. Once done, drain out the Jalebis from the oil and dip it directly into the warm sugar syrup and leave it for a 1-2 mins then remove it on a plate. 13. Use same method for the remaining batter/mixture and make more Jalebis. 14. Sweet, crispy, soft, juicy Jalebis are ready. You can garnish it with sliced pistachios and serve it with malai, dahi or basundi and enjoy the festive treat. • The batter fermentation time is depending on weather. • You could use any food color as per your choice. • Fry Jalebis always on low to medium flame. Sieve the flour, baking soda, cardamom powder and orange food color all together in a mixing bowl. Add yogurt into the flour mixture and mix it till no lumps. Add kewra water and mix it and make a thick, smooth paste like dropping consistency, but not too thin, add required water if necessary. Cover the mixing bowl and leave to ferment for 7-8 hours (time is depending on the weather). Once the batter is ready, it should be spongy and you can able to see bubbles on top of the batter surface, that means it’s perfectly ready. In a deep pan, add sugar, water, saffron strings, cardamom pods and lemon juice, and cook it on high flame till thick syrup. Check the syrup, take a drop of syrup (cooled) in between your thumb and finger and then pull the fingers apart, it should be one thread/string. Keep warm aside till you fry the Jalebis. Heat oil or ghee in a broad pan on low to medium. Mix the batter using a spoon, then take a squeeze bottle and fill it with the prepared batter. Check oil is ready, drop in a little bit of batter in the oil, and see if it comes up at once. If it does, that means oil is ready for frying. Now hold the bottle upside down and squeeze it and make a swirl into the hot oil, make more swirls straight into the hot oil and make as many as swirls you can, keep the space between Jalebis to avoid sticking. Fry both sides of the Jalebis till light golden brown on low to medium flame. Once done, drain out the Jalebis from the oil and dip it directly into the warm sugar syrup and leave it for a 1-2 mins then remove it on a plate. Use same method for the remaining batter/mixture and make more Jalebis. Sweet, crispy, soft, juicy Jalebis are ready. You can garnish it with sliced pistachios and serve it with malai, dahi or basundi and enjoy the festive treat. This is just fabulous and look at your image.. is simple irresistible.. ….